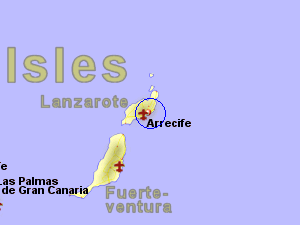 The weather station used for our Lanzarote data is based at Arrecife, on the south east coast. The climate for Lanzarote, along with the other Canary Islands, benefits from being considerably further south than mainland Spain (distance from the equator approximately 3/4 that of southern Spain), resulting in much milder winters. Additionally the summers are tempered by the cooling effects of the Atlantic Ocean and the Trade Winds on the relatively small land mass of the islands. Lanzarote is basically a dry island where it doesn't rain very often but with a higher chance of cloud and rain in the north. This effect is not as pronounced as in most of the other Canary Islands due to not having high mountains. Any rain that does fall on Lanzarote is most likely to occur as showers from November to March. Occasionally in the summer, the cooling north west winds can be replaced by easterly winds coming from central Africa and the Sahara desert, resulting in hotter and drier air than usual.